I have this theory that most of my mechanical watches perform at their best when worn constantly over a period of time. I suppose that is something a lot of us don’t do very often. But on my last 3 trips abroad I have had the chance to test this out. I have only taken the C60 GMT on these trips and wore it pretty much 24/7. Evidence? When it’s in and out of the box, stopped and started, on and off the winder it’s still good, but not that good! No hard evidence, but I see similar trends with other autos (C5, Tank) that are much less accurate on the winder. Whereas the C65 Diver (hand wound) is rock solid at around +1 s/d no matter what you do with it. Steve, I have had a similar experience, both autos and hand wound. In addition, my C65 is more accurate if I wind it twice a day, morning and night ,about -2.5sec/day, whereas winding once a day yields -4sec/day. I have to agree , my old C8 on a winder gained horrendously but on the wrist was a totally different beast and kept superb time . Don't really understand the science behind why this should happen but the truth all the same . The sad and inevitable inference is that I was correct all those years ago, when I said a fella needs two watches: an everyday watch and a dress watch. They can be alternated on the wrist. Anyone want to buy a 12watch Fortis winder and a few decent watches? I too have noted this, particularly with autos. I postulate that it is down to a combination of body temperature, position and full wind, ie the orientation of the watch varies unpredictably and the mainspring is kept more or less fully wound. The winder is the next best thing, but needs to be a vertical. Stopping and starting they don't seem to like, in fact I've noticed they settle down when worn for a few days once they come out of the safe to play. The effect with manuals is not so marked, but it is there. I have noticed that my C8PR (the only manual wristwatch I own) is better on the wrist than off, probably because I wind it every 24 hours when I wear it, though as mine runs a little slow in most positions, that should not really help. My C60 600 and C65GMT both seem to follow this pattern; if I wear them they keep better time than if I leave them in the winder. Both have been worn full time as my only watch for at least a week each in recent months. 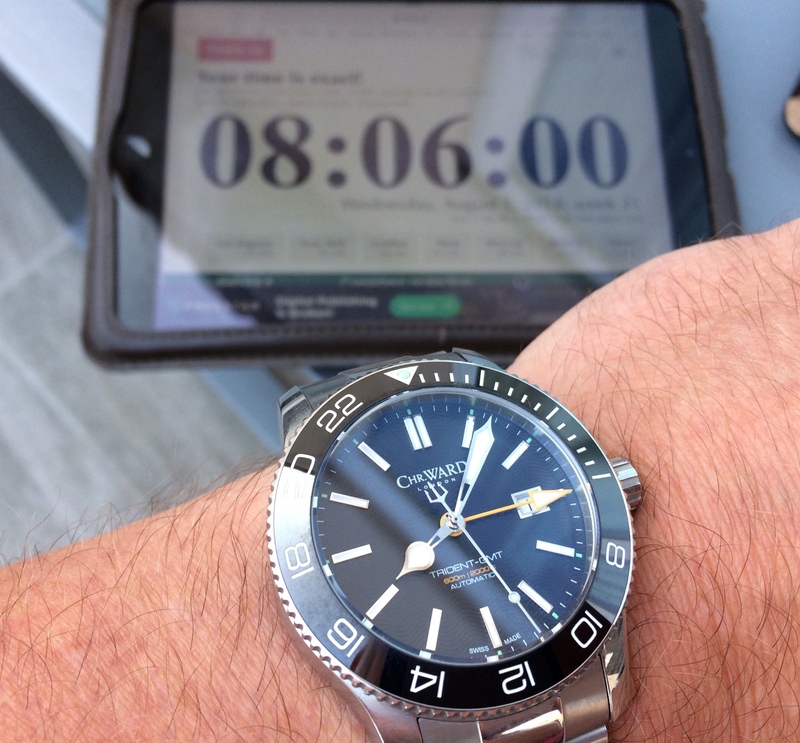 The C60 lost approx 2sec over its entire week and the GMT gained about 8sec over its week. You can’t argue with that for accuracy! When I leave any watch in my winder I have a program set that starts winding at 08:00 and winds for approx 3 hours (swapping directions every 3min) then pauses for half an hour before giving it another 3 hours of alternating rotations. This goes on until 21:30 when it stops for the night. I have set this program to try and mimic the constant, steady and varied arm motions that I go through on a daily basis. It does a good job of keeping the watch wound during the day, with more than enough power to get through the night, but timekeeping for any of my watches is never as good as when I wear them. In the winder the C60 gains about 4sec a day while the GMT loses about the same. Perhaps it is something to do with a variety of positions we inadvertadently “hold” our watches in during the day when resting, driving, working the laptop etc. Perhaps the steady temperature microclimate in our wrists also helps? Has anybody noticed that it seems to keep better time if left on the wrist at night versus the nightstand? How much can I possibly move in the night? But anecdotally it seems slightly better. But we all know that ain’t gonna happen, which is ultimately why we are confined, Regina volente, here in the Asylum. Amor Vincit Omnia wrote: ..... , which is ultimately why we are confined, Regina volente, here in the Asylum. I prefer the concept of 'Hotel California', Steve. Sadly, these days, I tend to change the watch I am wearing too frequently to really notice how good it is for timekeeping; other than its about right. I don't own a time checker machine nor do I have any timekeeping App installed on my phone (perhaps I should). Anecdotally I agree with AVO but I suspect that the biggest effect is the position the watch is left in over night. When I get a new watch I keep track of its precision for a couple of weeks and have definitely seen that the position that it is left in over night will definitely effect the overall precision of the watch. My C7 Apex is a good example. If it is left alone it will gain 5 - 6 seconds a day but if worn and left with the crown down over night it is about +3 seconds a day. My Constellation is another good example. Depending upon the position it is left over night its daily rate will vary between +1 second/day to +4 seconds per day. Some watches seem immune to this though. My Pro Mare is -0.5 seconds/day no matter what I do. And yes I am receiving professional help. Nor do I. RC bedside alarm, and time.is when travelling. Close enough. Maintaining a fuller state of power reserve (as happens when an auto is worn a lot) and averaging-out positional timing differences (as occurs on wrist), and wearing the watch in a similar manner/pattern each day is favourable for consistent time-keeping. But a huge influence will be how the watch performs in the overnight resting position - those eight or so hours will either help balance-out daily gain/loss or compound it. Assuming, that is, that you take it off. On holiday I generally didn't...staggered up and fell into bed! Actually, I usually wear a watch in bed. Ha, good work - you’re clearly doing the holiday thing correctly then!